Slower, but solid fourth quarter earnings. With two-thirds of S&P 500 Index companies having reported quarterly results so far, corporate America has delivered solid 17% earnings growth for the quarter. However, slowing global growth and trade tensions have challenged the outlook, setting up slower earnings gains in the coming year. In our latest Weekly Market Commentary, due out later today, we provide key takeaways from earnings season and update our 2019 earnings outlook. Looking ahead, the bar has been substantially lowered for the first quarter, setting up potential upside surprises. We expect S&P 500 companies will be able to at least deliver mid-single-digit earnings growth in 2019, driven by solid economic growth, fiscal stimulus and share buybacks. Busy week. The S&P 500 barely eked out a gain last week after negative developments in trade talk progress weighed on U.S. stocks in the middle of the week. This week will be busy, as U.S. and Chinese officials meet again on trade negotiations before a March 1 deadline for increased tariffs, and Congress continues budget discussions to avoid another partial government shutdown. 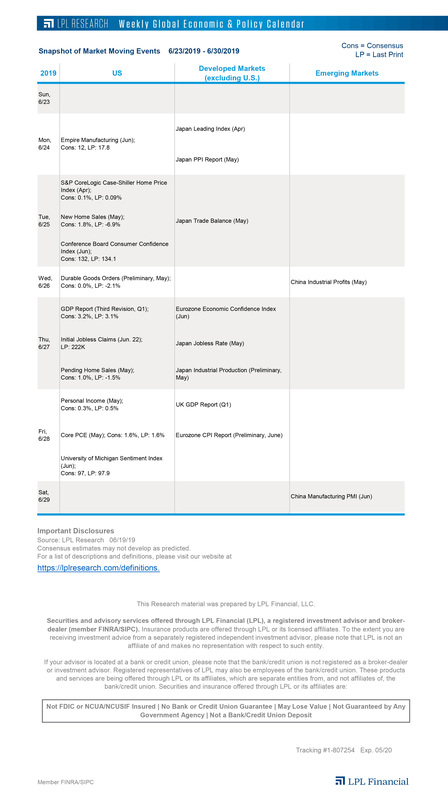 About 70 S&P 500 companies are also scheduled to report, and gross domestic product (GDP) reports from Germany, Japan, and the composite Eurozone are slated for release over the next few days. UK GDP disappoints. Data today showed the United Kingdom’s GDP growth slowed to 0.2% in the fourth quarter and 1.3% year over year, tying its slowest pace of annual growth since 2012. Ongoing Brexit uncertainty and a deterioration in global trade have weighed on the UK economy recently. Corporations have curbed business investment in the country for four straight quarters, the longest streak since 2009, as they wait for clarity on Brexit. While slowing U.K. output has a negligible effect on global growth, as the U.K. economy constitutes about 2% of world GDP, investors have been increasingly nervous lately about slowing growth overseas. We remain cautious on Europe due to geopolitical concerns and tepid economic data. Feeling confident? Four months after reaching an 18-year high, the Conference Board’s Consumer Confidence Index has dropped 18 points, its biggest such slide since 2011. Sentiment’s swift decline has caused some to wonder if a drop in confidence could be self-fulfilling, as lower confidence could weigh on consumer spending, and consequently, on output. We’ll highlight our thoughts on the drop in confidence, and what it’ll take for sentiment to stabilize in this week’s Weekly Economic Commentary, and on the LPL Research blog later today.